Life at the Stillman School is vibrant, and you will want to fully experience every minute of it. Our Stillman Passport will help you plan to take advantage of what's in store for you at this great business school. Here you'll find opportunities for the upcoming year, such as attending the School's Integrity and Professionalism Convocation, or writing an article for The Stillman Exchange. Review these options now, and make plans to travel to your favorite "ports of call." Learn about the School, the faculty, your classmates and yourself. And of course, get your Passport "stamped" by swiping your ID or signing in at each event! Watch Your E-Mails for additional passport opportunities. The learning experiences will be invaluable, and you'll be thrilled that you made the investment in yourself! 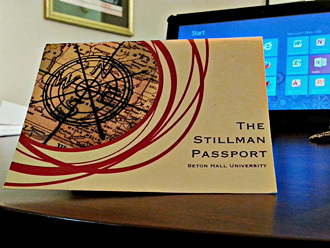 Check in to any Stillman Passport event. Either scan the QR code with your smart phone, swipe your ID card, or sign in and your Passport stamp will be on its way. Once you’ve earned a stamp, you can display it in your email signature, blog and wherever else you'd like. You can also compete on the Leader Board! Best wishes for a wonderful first year! There are mandatory events that all freshmen must accomplish by the end of the first year at SHU. Inclusion in the Passport program serves as a reminder, but you will be notified through e-mail, Blackboard and the LCD sign located on the second floor of Jubilee Hall as the events draw near. There are "optional" events sponsored by Stillman and other campus organizations. These have been identified by the Stillman faculty, administration and students as adding value to your Freshman experience. Seton Hall's Badges program is designed to be compatible with Mozilla's Open Badges Initiative. The Open Badges Initiative is based on the idea that learning today happens everywhere, not just in the classroom, but it's often difficult to get recognition for skills and achievements that happen outside of school. Mozilla's Open Badges project is working to solve that problem, making it easy for anyone to issue, earn and display badges across the web -- through a shared infrastructure that's free and open to all. The result: helping learners everywhere display 21st century skills, unlock career and educational opportunities, and level up in their life and work. Learn more here.